Thanks to the implementation of the EFRA Project, the LOTOS Group will discontinue production of heavy fuel oil, a fraction obtained from petroleum distillation. Once the new installations are put in operation, instead of fuel oil the Gdańsk refinery will produce more engine fuels meeting all applicable environmental standards, and coke. In the planned coking installation, some unique, rarely used environmentally friendly solutions will be applied. They will ensure maximum safety of coke production for the natural environment. LOTOS engineers have analysed different solutions currently used at delayed coking units (DCU) in European refineries. Once the EFRA Project is completed, that is after the new facilities are constructed, the selected technologies and solutions will facilitate the production of more high-margin fuels while ensuring that the refinery fulfils the ever stricter environmental protection requirements. The main task was to prepare a precise technical description of the target DCU model and link it with the process of coke production and transport. “A coking unit differs materially from other refinery installations. Its product, produced in a special reactor, is coke - a solid. Its further processing, called discharge, will require periodic opening of the valves which separate reactor’s contents from the environment. And this involves various gases escaping outside, to the atmosphere”, explainsTadeusz Wróbel, Head of the Trades and Technical Team of the Engineering Support Office for the EFRA Project. In typical solutions, applied worldwide in DCUs, the coke, ground with a water drill, is discharged from the reactor together with water (with the temperature of a few dozen degrees) into an open concrete basin where it is cooled down through partial evaporation of water. At the same time, hydrocarbons from coke are released into the environment. To accelerate the drainage, the coke in the basin is poured using crane’s dipper. Next, the same crane conveys it into a crusher, from which it is transported on conveyor belts. Such methods may have a negative impact on the environment. 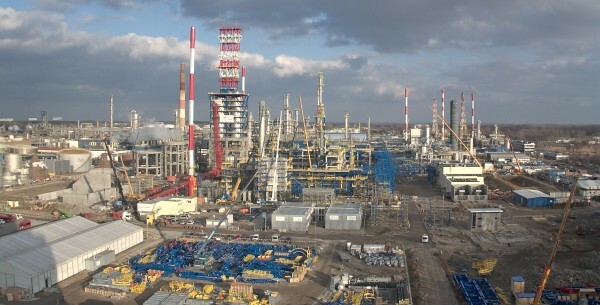 Therefore, LOTOS engineers decided that different, much more environmentally friendly, solutions for coke production and transport will be applied at the Gdańsk refinery. “Our ambition is not to increase the impact, both in terms of air pollution and our neighbours’ comfort, that the refinery will have on the environment once the DCU is launched. That is why we have decided to implement two solutions that go beyond environmental protection regulations. We have chosen the proven technology of Germany’s Triplan and are enhancing it with our own extra improvements,” emphasises Tadeusz Wróbel. LOTOS engineers decided that before opening the DCU reactor the water pressure will be reduced more than it is normally done in typical DCUs, in order to achieve a maximum withdrawal of volatile hydrocarbons still before the coke cutting process. To this end, a vacuum pump, much more efficient than the one recommended by the licensor, will be installed. This will ultimately help to reduce the amount of escaping steam and volatile hydrocarbons. In the next stage of the process, instead of an open basin for unloading and draining coke, a closed hermetic system will be used. In this way, all the processes related to coke unloading, transfer, storage, loading and transport out of the refinery will be carried out in a manner that ensures above-standard environmental safety. “In our investment projects, we look at a broad spectrum of technological options and do not rely only on the knowledge and solutions of one specific licensor. We draw from the experience and innovations of other manufacturers who have used the DCU technology for years, but we also introduce our own solutions. In going beyond standard solutions, we minimise environmental impacts, improve working conditions at the refinery and take care of our neighbours’ comfort,” says Mieczysław Broniszewski, Head of the Environmental Protection Office of the LOTOS Group. Environment-friendly transport of coke from the refinery is also ensured. Once the truck is loaded with coke, its wheels and chassis will be washed and dried. After the tarpaulin is pulled over, the truck will be ready to leave the refinery, heading for the coal terminal at the Northern Port. The choice of trucks to carry the coke was made by the coke buyer, Oxbow Energy Solutions of the Netherlands, with which LOTOS Asfalt signed a 10-year contract. Trucks will only be used at daytime to reduce any possible nuisance caused by their operation.